Can I Substitute Sour Cream for Yogurt in Gyro Sauce? Can You Make Chocolate Ganache Frosting With Half-and-Half? Does Cooking With Yogurt vs. Sour Cream Taste Different? Substitute yogurt for sour cream without affecting the taste of most dishes. 2 Can You Bake Greek Yogurt? 3 Can I Substitute Sour Cream for Yogurt in Gyro Sauce? 4 What Is Balkan Yogurt? Cream sauces, dips, dressings and desserts made with sour cream are luxurious and rich, but if you’re looking to lighten a dish, yogurt is often a good substitution for sour cream. In some recipes, you can use yogurt without affecting the taste or texture. In other recipes, a few minor adjustments are all that are needed to make the recipe just as luscious. Sour cream is thick, creamy and rich, which makes it so appealing. When added to sauces or used as a topping, sour cream adds a savory flavor to the dish. Plain, unsweetened yogurt has a similar taste to sour cream, but it is not as thick. On the other hand, Greek yogurt has the same consistency as sour cream, but with a stronger flavor. You are less likely to notice a difference in dishes when you use plain yogurt for sauces and baked goods, and Greek yogurt for entrees that feature a large amount of sour cream. Greek yogurt is also a great substitute for toppings for chili, baked potatoes or tacos because it tastes more like sour cream than regular yogurt. You'll hardly notice a difference in tastes when you use yogurt instead of sour cream in certain recipes. Sour cream coffee cakes, pound cakes and cookies that call for this creamy ingredient are just as easy to make using yogurt, with little difference in taste. The other ingredients in baked goods will mask any subtle differences between sour cream and yogurt. Greek yogurt is best when making dips and dressings because it has many of the same characteristics of sour cream. Its thick consistency and strong, rich flavor stand in for sour cream in a way that the taste isn’t affected. The most significant difference between yogurt and sour cream is their reactions to heat. When used in a cream sauce or added to a soup, yogurt tends to separate into curds and whey, creating an unappetizing texture -- something that doesn’t happen with sour cream. To avoid this, temper the yogurt by adding a few spoonfuls of the other hot ingredients to the yogurt itself, stirring it gently to slowly warm it up before adding it to the larger portion. 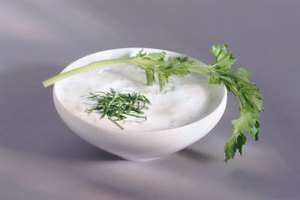 By adding it to a dish after it has been removed from the heat, yogurt will hold together better, mimicking the taste and texture of sour cream beautifully. Unlike some substitutions, sour cream can be replaced with yogurt at a 1-to-1 ratio. So, whether you’re using plain or Greek yogurt, you can substitute 1 cup of yogurt for 1 cup of sour cream. Plain yogurt is thinner than Greek yogurt or sour cream, so if you use it for making dips and dressings, allow the mixture to chill for a couple of hours before serving. This will allow the yogurt to thicken to the proper consistency. Can You Substitute Yogurt for Milk in Bread? Can You Use Coffee Creamer in Place of Milk in Cooking? What Can You Do to Tone Down Curry Flavor?